Beautiful Jewelry Gifts for an Anniversary. Choose a perfectly cut stone in a beautiful metal setting to offer a trully amazing gift with the ocassion of an anniversary. At Diamond essence you can find the best offers and the highest quality in simulated diamonds that come with a lifetime warranty! Diamond Essence Emerald Studs,0.5 carat each set in 14K Gold Vermeil , 1.0 ct.t.w. (Also available in 14K Solid Gold , Item#GED561). Choice of 2.0 cts.t.w. and 4.0 cts.t.w. available. Diamond Essence Pear Studs, 0.5 carat each, set in 14K Gold Vermeil, 1.0 ct.t.w. (Also available in 14K Solid Gold, Item# GED563). Choice of 2.0 ct.t.w. and 4.0 ct.t.w. available. Diamond Essence 0.5 carat each, round brilliant stone set in 14K Gold Vermeil tubular bezel setting. 1.0 ct.t.w. Choice of 2 and 4 ct.t.w. available. Diamond Essence 0.5 carat each, round brilliant DE Sapphire stone set in 14K Gold Vermeil tubular bezel setting. 1.0 ct.t.w. Choice of 2 and 4 ct.t.w. available. Pair of Studs in three prongs Martini Setting, Round Diamond Essence in each stud. 1.0 Ct T.W. set in 14K Gold Vermeil. Diamond Essence Stud In a Two-Bar Tension Setting With Round Brilliant Stones 0.5 Ct. Each In 14K Gold Vermeil, 1 Ct.T.W. (Choice of 2 Cts.T.W. and 4 Cts.T.W. available.) (Also available in 14K Yellow Gold, Item# GED527). Bezel set Diamond Essence studs. 2.0 cts. t.w. round brilliant stones set in 14K Gold Vermeil. You design the perfect Diamond Essence diamond pendant by choosing the shape and size in Platinum Plated Sterling Silver. Pink Diamond Essence gems, 2.0 cts. t.w., in Gold Vermeil. Diamond Essence Round Brilliant Studs, Each set in Tension-Setting of 14K Gold Vermeil, 1.50 Cts.T.W. One carat pear cut Diamond Essence stone set in Platinum Plated Sterling Silver in four prongs. Choice of 2 and 3 carat available. 1 Ct.T.W. - Approx Size Of Pendant Is 13 mm Length And 5 mm width. 2 Cts.T.W. - Approx Size Of Pendant Is 15 mm Length And 8 mm Width. 3 Cts.T.W. - Approx Size Of Pendant Is 17 mm Length And 8 mm Width. Trilliant-cut diamond studs give off plenty of sparkle. 2.0 cts. t.w. in Gold Vermeil. 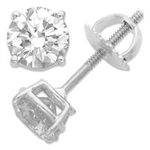 Pair of Studs in three prongs Martini Setting, Round Diamond Essence in each stud. 2.0 Cts T.W. set in 14K Gold Vermeil. Diamond Essence Star Pendant. 2.5 ct. set in five prongs Platinum Plated Sterling Silver setting. Diamond Essence stones float in an open-cut disc. 1” diameter; 1 3/8” long. 0.74 cts. t.w. in sterling silver. Diamond Essence round brilliant 1 carat stone set in Platinum Plated Sterling Silver bezel setting. . Earrings Shown For Reference. A perfect triangle-cut one-carat Diamond Essence stone pendant in Platinum Plated Sterling Silver. .
Diamond Essence Unique Bezel set drop earring with 1 ct. each in 14K Gold Vermeil. 2.0 cts.t.w. Choice of 4.0 cts.t.w. are available. Traditional studs with a twist on the bezel set that shows small accents sideways too! Confess it...you always wanted this! 2.20 Cts. T.W. in 14k Gold Vermeil. Diamond Essence round brilliant melee set in floral design with 0.25 ct. center, in 14k Gold Vermeil. HorseShoe Slide Pendant Holds a 0.35 Cts.T.W. Round Brilliant Diamond Essence Stone in Platinum Plated Sterling Silver.Classic example of art. An anniversary is the occasion when one would make a grand gesture to show his or her love and appreciation for their significant other. Diamond Essence jewelry is the perfect anniversary gift. Browse our collection and choose a exquisite solitair design in case you are celebrating a wedding anniversary, pick a beautiful Diamond Essence tennis bracelet for a relationship anniversary, or choose a beautiful pair of earrings she will wear with pleasure. Choose a jewelry that would fit her style and make sure she will love you more for it. In case you want to offer your man jewelry gift , choose an outstanding man's ring . There are a multitude of designs to choose from so you can be sure you will find that special ring that will fit his style. We cater every style and every cost oriented choice so you can choose from gold, silver, gold vermeil or platinum plated metal setting.